Brewers and distillers obsess over cleanliness, and for good reason. Sediment trapped in the tanks, pipes or valves can be a potential source for contamination. Because of this, caustic cleaning is carried out regularly, usually followed by a steam cleaning for sterilization. That is why stainless steel sanitary valves are your best choice, they can withstand the high temperatures and chemical attack and can be manufactured with smooth surfaces that leave no microbes to hide. Valves used in brewing are either threaded or use the tri-clover clamp design, which is preferred because it’s difficult to get sediment out of threads. We can help you control your flow with manual or actuated valves. Contact us today for more information on how we can help you! 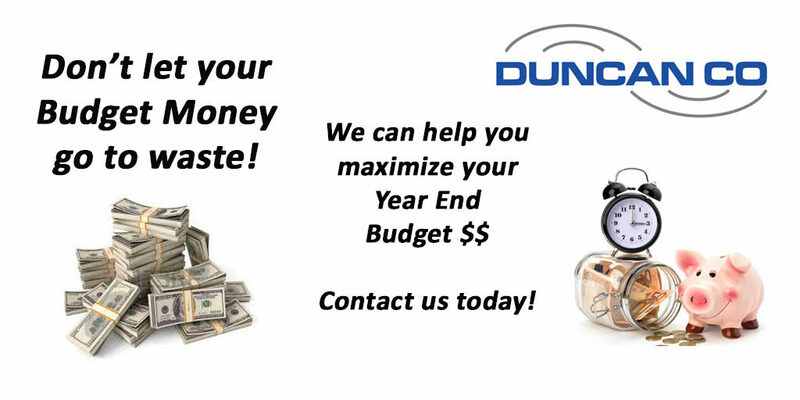 Don’t let your Year End Budget Dollars go to waste – Duncan Company can help you maximize your spending! 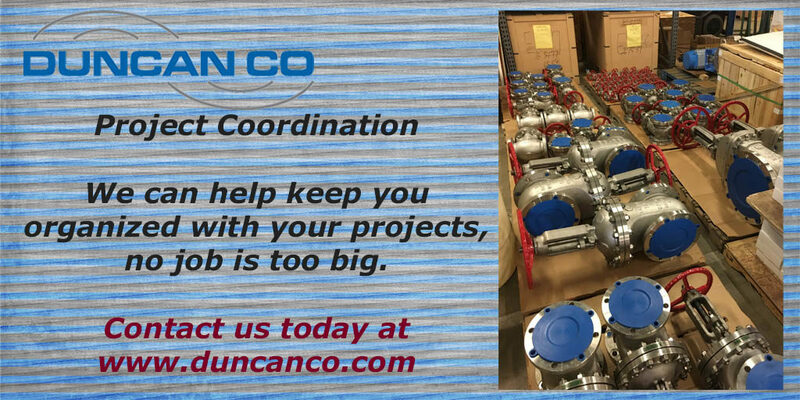 Comments Off on Don’t let your Year End Budget Dollars go to waste – Duncan Company can help you maximize your spending! With the Holiday’s just around the corner, it’s time to think about maximizing your Budget $$. Don’t let those unused dollars go to waste, contact us today to see how we can help you with your Year End planning! TIC manufactures 3-A sanitary flow meters in a variety of sizes and (2) process connections, Tri-Clamp or Tube Ends to allow for easy installation on site. All flow meters and flow switches feature a 15Ra or better unobstructed internal surface finish, that allows for easy cleaning to prevent any sort of contamination in the process. All flow meters and flow switches arrive fully calibrated to your unique fluid, flow range, temperature, and pressure range. Thermal Instrument Flow Meters are available with either an integral, or a variety of remote electronics. They can be configured to measure and totalize the flow rate, output process temperature, or just simply notify an operator when a certain process condition has been met. The 3-A symbol is recognized by food and beverage processors around the world. An instrument that has been stamped with the 3-A symbol instills confidence that it has passed through extensive 3rd party review and meets the most up to date sanitary standards. All materials of construction meet Good Manufacturing Practice (GMP) allowing for ease of cleaning and drainage to avoid contamination. Our Model # 600-9SAN3A meets 3-A Flow Meter Standard 28-05 and ANSI 3A/00-00-2014 sanitary design standards. 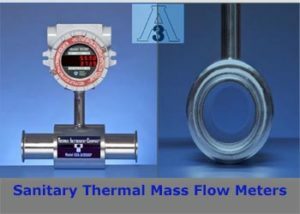 Thermal Mass Flow Meters, by TIC, are excellent options for measuring your food and beverage processes. The benefits include: no moving parts, wide turndowns, an unobstructed flow path, and negligible pressure drop for your application. 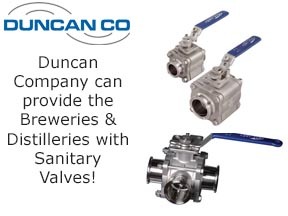 For more information contact us at Duncan Co! Spirax Sarco, the leader in products and services for steam system management, announces the release of the PV4 and PV6 piston valves for isolation purposes. They are available in NPT and SW versions, in sizes from 1/2″ to 2″, in either forged carbon steel or forged stainless steel. 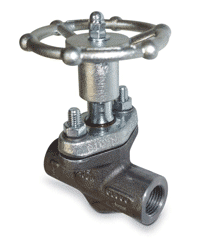 These valves are designed to Class 800 and provide tight shutoff, suitable for steam, condensate and other liquid systems. The highly reliable and robust PV4 and PV6 will give customers the peace of mind they need knowing that it has been rigorously tested and developed for use in the Oil, Gas and Chemicals industry where they are considered an industry standard for the isolation of steam, condensate and process media. 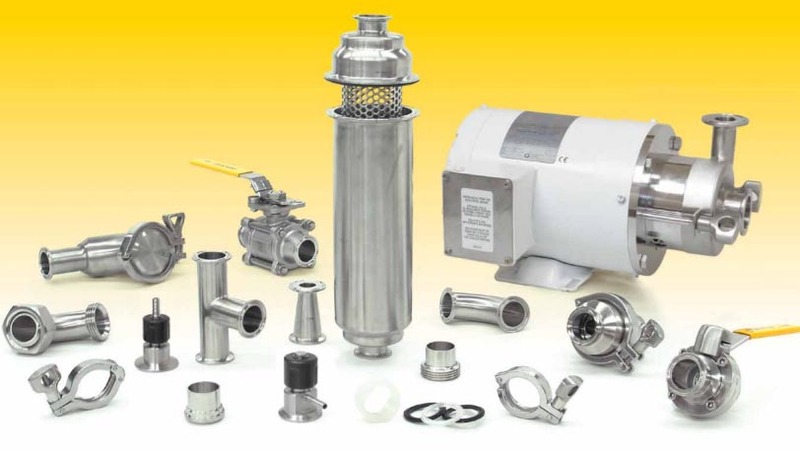 Top Line Processing Equipment has an extensive product line which includes valves, pumps, fittings, tubing, strainers and clamps and is the most complete in the industry. Our products are in compliance with industry organizations including FDA, USDA, ASME BPE AND 3A sanitary standards. Contact us today for help finding you the right solution for your applications! 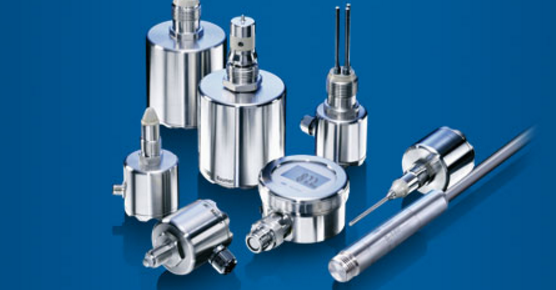 Baumer Level Measurement – The right solution for every job! Comments Off on Baumer Level Measurement – The right solution for every job! Add in the requirements on what can be installed, cleaning, whether hygiene standards apply (3A) and the degree of precision required. Our wide-ranging technology skills, we can off you the right solution every time. 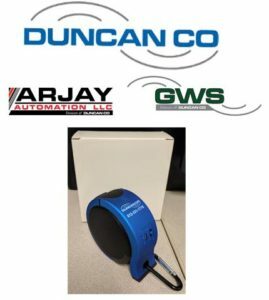 Contact us at Duncan Company for help on how we can help you with your applications! 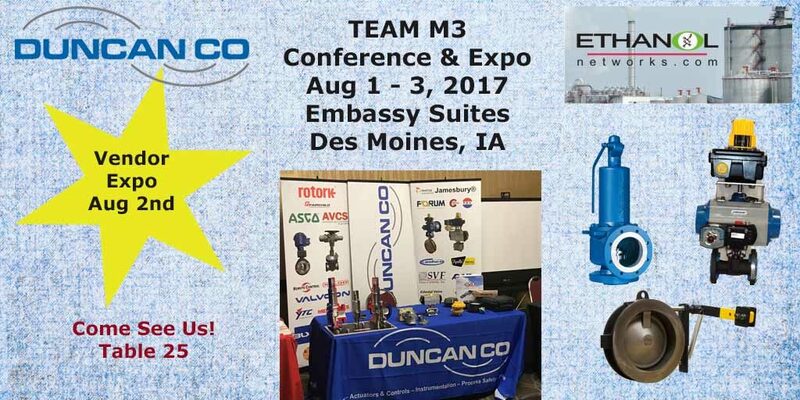 Duncan Company is at Table 25 at the TEAM M3 Ethanol Maintenance Managers Meeting today, August 2nd. Exhibit Hours are 9AM to 4PM. Come See Us! 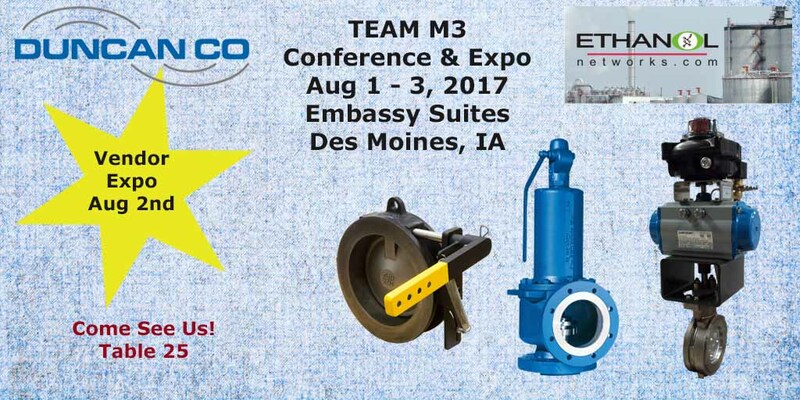 Duncan Company will be exhibiting at the Team M3 meeting in Des Moines, IA this August 2, 2017 at the Embassy Suites. Please stop by to see how we can help you manage your Ethanol Plant with our products. Do you have projects that need help with coordinating the arrivals at your job site? Duncan Company can help you with delayed shipments, custom tagging, coordinating deliveries with your contractors. 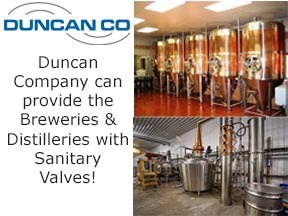 Since 1909 Duncan Company has grown into one of the Midwest’s premier suppliers of Valves and Actuation, Instruments & Controls, Piping Specialties and Process Safety. Contact us today to see how we can help you at sales@duncanco.com!